Gluten-free foods seem to be everywhere these days, from supermarket shelves to restaurant menus. But just what is gluten? And why do some people need to avoid it? Gluten is a type of protein that?s found in grains like wheat, rye, and barley. It?s actually made up of two types of protein: gliadin and glutenin. Gluten helps foods stay together and maintain their shape, and gives bread its chewy texture. Gluten isn?t unhealthy, but it can cause problems for people with celiac disease, gluten sensitivity, or wheat allergy. In celiac disease, the immune system reacts in the presence of gluten, damaging the small intestine and preventing nutrients in foods from being properly absorbed. Celiac disease causes symptoms like stomach upset, joint pain, skin rashes, and fatigue when people consume gluten-containing foods. Gluten sensitivity causes symptoms similar to those of celiac disease?including diarrhea, fatigue, and joint pain, but no intestinal damage is occurring. 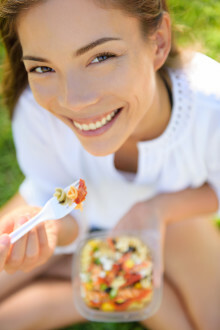 People with a wheat allergy develop a reaction after eating wheat-containing foods. That reaction can involve hives, swelling of the face, nausea, diarrhea, and rash. Anyone who has celiac disease must stay away from gluten. People with allergies and sensitivity also need to be very careful about what they eat. Anyone with gluten intolerance needs to know which foods contain gluten, and then avoid or limit them. The most obvious place to find gluten is in grain products?cereals, baked goods, breads, and pasta. Yet gluten can also be an ingredient in non-grain foods, such as soups, sauces, salad dressings, food colorings, malt vinegar, and beer. When grocery shopping, people with gluten intolerance should read food labels. And when they dine out, they need to let their server know they have a gluten sensitivity, allergy, or celiac disease. Many different grain products contain gluten. Varieties include durum, semolina, spelt, farina, farro, graham, kamut, rye, triticale, wheat starch, and malt.